My latest petticoat trim continues to progress in an orderly fashion. This one isn’t nearly so quick to work up as the last, and by rights it should be taking even longer — I just realized that the pattern asks for size 16 thread, not size 10 like the first (crochet thread gets thinner as the numbers go higher). Tonight, while watching reruns of Bonanza on DVD — come on, who doesn’t love Little Joe? — I finished the last four motifs and started on the first of three or four more rows that will join it all together. Of course I plan to make all of the “following six collars” in the very near future. 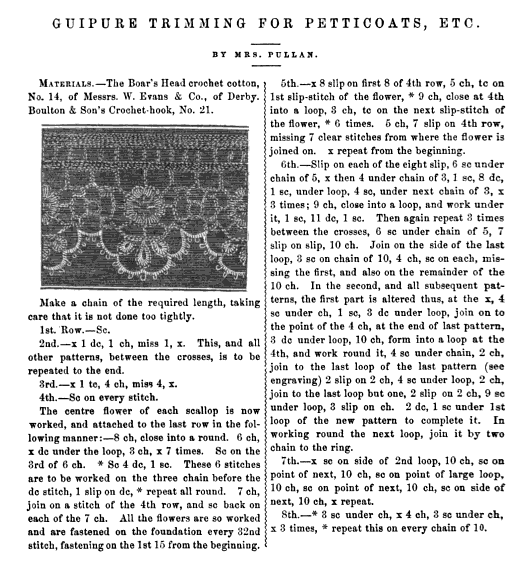 Though I think I will need to order some finer cotton and dig out my REALLY tiny hooks (or tambours as they were properly called in English, before the french term crochet, meaning hook, took over in the 1840s — I’ve also seen them referred to as crochet needles). 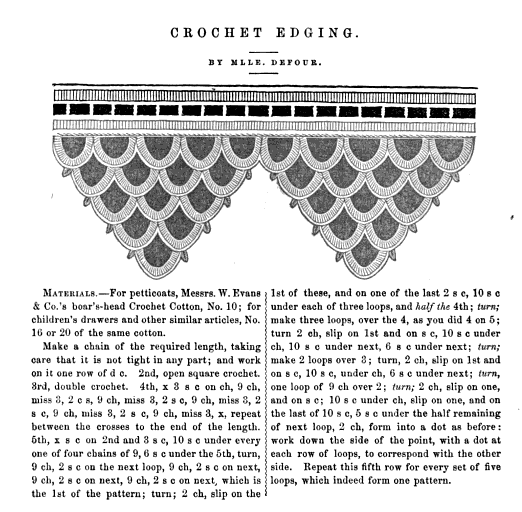 I’ve been doing a lot of reading about the development of crochet in the first half of the 19th century, including other works by needlework greats Miss Lambert, Cornelia Mee, and Eléonore Riego de la Branchardière, to name a few. I’ve also found at least four new petticoat trims in crochet from the 1840s and 50s, including one worked the short way! For now, back to my faux guipure. Here’s another edging, recommended for petticoats, from Peterson’s, 1855. The pattern was remarkably well written and easy to follow, especially with the clear and accurate illustration. I still haven’t figured out how to gauge sizes on 19th-century cotton, but I’ve found some patterns for very fine tatted lace that call for no. 20 or 30 boar’s-head cotton, and directions for a coverlet calling for no. 10. So I am going to presume that, like today, the higher size numbers indicate finer thread. This pattern bears that out as well, asking no. 10 for a petticoat trim, but 16 or 20 for a child’s drawers. I used what I had on hand to make up a sample — modern no. 16 cotton and a 1.3 mm hook. I don’t think I’d want to trim a petticoat with anything thicker than a modern no. 16; this is a pretty edging, but a bit on the stiff side already. It does seem strong, which was a frequently stated prerequisite for any undergarment trimming (they boiled their laundry, then it was wrung out, and finally put it through a mangle). Best of all, even though it is worked over the full required length for the first four rows, it does work up relatively quickly. I wouldn’t mind making 100 or so inches of this to trim a petticoat. Someday.